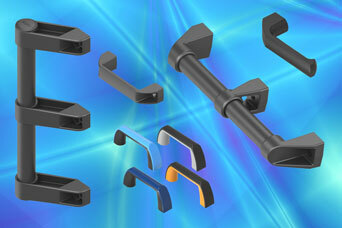 The ubiquitous need to allow an interface for the human hand with industrial equipment of all sizes has led us to offer the 1095 program of handles which provide an easy solution – easy to use, easy to install. Known variously as bow handles, bridge handles or simply as pull handles, the versions from EMKA in comfortable round or oval grip styles, are readily fixed from front or rear depending on type, with sizes suitable for single hand use from 120mm up to 500mm in length. Longer handles to span wide panels or for double hand operation of heavy lids, for example, are designed as tubular module installations with end brackets and intermediate supports as required. For equipment carrying or for packing cases, this 1095 program includes chrome plated or stainless steel handles – also a recessed version and an edge/corner mounting tubular handle which also serves as a convenient corner stand and protection device. Share the post "The 1095 program – bow/bridge, tubular and chest handles for industry"